Idina is/was featured in the November issue of Gotham Magazine. The magazine is really difficult to find, even in its focus of New York City, but we were able to track down a scan of her full-page interview. Click the gorgeous photo below to read it in the gallery! The Dove Sing4All Brush With Greatness contest Idina is co-sponsoring has reached its halfway point, so a new video has been released. Watch it below! Oh, and details on entering the contest – winning group gets to Skype with Idina – are available at the streaming link. Description: Idina partnered with Dove to promote their “My Favorite Things” singing contest. Happy Black Friday to everyone in the US! Wondering what Black Friday is, or why it’s called that? It’s the biggest shopping day of the year in the US with ridiculous sales that begin at even more ridiculous times of the early morning following Thanksgiving. It’s named “Black Friday” since it’s Friday and the stores’ revenues are “in the black,” which means the day is profitable (as opposed to losing money or being “in the red). There’s your education for the day! 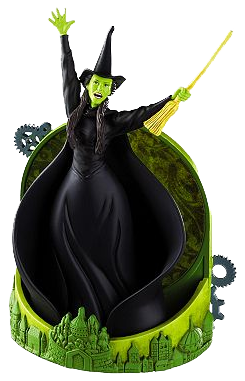 If you are out Black Friday shopping, you may want to stop at Kohl’s for an exclusive Wicked-licensed Elphaba Christmas ornament. It even plays “Defying Gravity,” and yes, it’s Idina’s voice! It’s currently sold out online, but some stores may still carry it, and they might restock online in the coming days leading up to Christmas. If you find one, snap it up! Note: You may also have luck finding it at Meijer retailers, or online via Long Island Treasures. If you’re in Canada, check Carlton Cards! Thanks for the tips, Linda and Lauren! Idina will be making her New York Philharmonic debut on February 5, 2011 with legendary composer and conductor Marvin Hamlisch! Tickets, which start at $35, will go on sale for subscribers and donors on November 23, 2010, at 10:00 a.m., and for the general public on November 30. All tickets may be purchased online at nyphil.org or by calling (212) 875-5656, 10:00 a.m. to 8:00 p.m., Monday through Saturday, and 12:00 noon to 5:00 p.m. on Sunday. Tickets may also be purchased at the Avery Fisher Hall Box Office or the Alice Tully Hall Box Office at Lincoln Center, Broadway at 65th Street. The Box Office opens at 10:00 a.m. Monday through Saturday, and at noon on Sunday. On performance evenings, the Box Office closes one-half hour after performance time; other evenings it closes at 6:00 p.m. To determine ticket availability, call the Philharmonic’s Customer Relations Department at (212) 875-5656. An exclusive presale for ALL fans (not just fan club members) begins at 5:00 pm EST, November 23! Click here and enter promo code “idinafans” to purchase! Hollywood’s most talented and irreverent stars will gather at the Hollywood Palladium to celebrate “Trevor LIVE”, the annual show benefiting The Trevor Project on Sunday, December 5, 2010. Recognizing the suicide prevention efforts of community leaders, the Trevor Life Award honoree is Kathy Griffin, and Trevor Hope Award honoree is Levi Strauss & Co., with guest performances by Sarah Silverman, Wayne Brady, Taye Diggs and Idina Menzel, Neil Patrick Harris and James Marsden, Queen Latifah, Telly Leung, The Dan Band, and Tracie Thoms. This one-of-a-kind show is under the guidance of Special Guest Producing Director Adam Shankman, with Special Guest Musical Director Ricky Minor, Special Guest Choreographer Mia Michaels, and Special Guest Script Writers Carol Liefer & Bruce Vilanch. For more information on attending, please visit TheTrevorProject.org.